ONE OF IRELAND'S most interesting gatherings of artists, technologists, writers, musicians, and designers will kick off on Saturday morning, 8 March, in Kilkenny Castle. Called Creative Camp, it borrows the very successful un-conference model from similar events held throughout Ireland. That means admission is free and the day includes more several strands of presentations running in parallel time slots. As its schedule online shows, Creative Camp Kilkenny blends ideas and products at the intersection of art, design, culture and technology. Its website sits on the barcamp.ie domain and appears at the top of the list when searching Google for a map to the destination (Kilkenny Castle) and public transport routes. It kicks off in the historic Parade Tower (the round part in the photo at left), a venue that seats 120 comfortably and includes its own bar area. Several breakout rooms inside the tower will ensure the day includes a lively set of spirited discussions. Discussions and speaker-led conversations during 45-minute sessions make the Creative Camp model interesting in its own right. While most Irish conferences operate with paid admissions and one-way presentations delivered from the front, the unconference format operates with the “law of two feet” which says people should walk out when they have heard enough. In practise at a half dozen earlier events, the format has proven collegial and constructive. Keith Bohanna, one of the organisers, wants to make the event carbon neutral so he has arranged for the planting of a dozen native Irish species trees. “These will absorb an estimated 8.4 tonnes of C02, the equivalent of driving over 44,000km in a 1.6 litre petrol car.” That just about covers all the miles to be notched up by people driving to CreativeCamp. “Why not car pool to Creative Camp?” asks one blog post. The Creative Camp blog already has several people offering seats from Cork, Limerick, Galway and Dublin. Based on the number and quality of proposed topics, the technology strand of the event will be very subdued. Several gadgets will attract their share of attention, including an ultraportable notebook computer being used by Tipperary Institute and available for €320. One session by Conor O’Neill shows how to make video clips on a Nokia phone and then immediately and share them online through a social network. A talk by Brian White on GPS shows how to make satellite navigation part of your company’s branding. Damien Beresford from Tax123.ie explains how to outsource part of your workload to free up creative time. Mary Carty, the Arts Officer for County Meath, provides insights about branding an arts office within a county council. She has piqued the interest of several postgraduate arts students in Ireland whose blog comments indicate they desire to learn the best ways to get the most out of social media tools. Mary’s talk complements Cathy Fitzgerald’s seminar about “creating a vibrant, connected arts community in the southeast.” Many challenges and opportunities surround artists when they try to connect online and build a successful network with their peers. Business consultant Krishna De returns to Kilkenny with a conversation about “bringing that book inside you to life.” She offers “loads of practical advice on how to publish and promote a book by using the internet.” Krishna offers professional consultancy on this idea but during Creative Camp she will distill the main points and lead a seminar session about the topic. Perhaps the most intriguing session is called “How to Blog Like a Boy.” This afternoon talk by Sabrina Dent acknowledges that women have come to blogging from different socialisation, communications and linguistic backgrounds than male bloggers. They have distinct advantages and disadvantages that Sabrina’s seminar examines, showing how women can “free their voices, raise their profiles, and position themselves as authoritative bloggers in Ireland. Sabrina also joins a panel discussion alongside Krishna De billed as “Grabbing the Blogosphere by the Balls.” Prominent Irish bloggers Elly Parker, Martha Rotter and Alexia Golez have already started talking online about where they plan to talk the discussion and already have attracted pages of commentary online, so this discussion will probably attract a standing crowd. Joe Drumgoole talks about “The Art of Software Development” and looks at the process as a creative one rather than an engineering process. He suggests that a more artistic approach “seems to result in genuinely successful software,” citing Linux, Wordpress and emacs as examples. Published in the Irish Examiner, 15 February 2008 -- "Creative Camp blends the right mix"
James Corbett and Ken McGuire offer ways to graze feeds for CreativeCamp contributors. 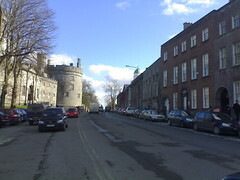 Check out the most interesting photos of Kilkenny on Flickr. My most interesting photo from Kilkenny includes a Moleskine. Fact: Google thinks Sabrina Dent is creative. Fact: Google thinks Ken McGuire is really creative (188 results). Fact: Google thinks Krishna De is really really creative (1040 results). Fact: Google thinks Joe Drumgoole is creative (5 results).